Tag Archives: Willie Monroe Jr.
Middleweight champion Gennady Golovkin and former middleweight champion Julio Cesar Chavez Jr. will appear in separate fights in the Southern California area in May and April, respectively. Chavez (48-1-1, 32 KOs), of Mexico, will take on Andrzej Fonfara (26-3, 15 KOs) of Poland in the light heavyweight main event April 18 at StubHub Center in Carson (on Showtime). Then, four weeks later, Golovkin on May 16 will defend his middleweight championship when he tangles with Willie Monroe Jr. at the Fabulous Forum in Inglewood (on HBO). Golovkin, of Los Angeles via Kazakhstan, is 32-0 with 29 knockouts. Monroe, of Rochester, N.Y., is 19-1 with six knockouts. Directly underneath Golovkin-Monroe, Roman “Chocolatito” Gonzalez (42-0, 36 KOs of Nicaragua will defend his flyweight world title when he squares off against Edgar Sosa (51-8, 30 KOs) of Mexico. Gonzalez has also held world titles in the strawweight and light flyweight divisions. Middleweight champion Gennady Golovkin of Kazakhstan will make his next title defense May 16 at the Forum in Inglewood against Willie Monroe Jr. of Ithaca, N.Y. (on HBO). 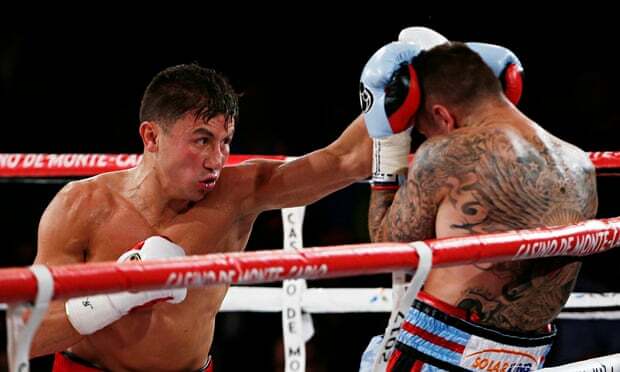 Golovkin most recently stopped Martin Murray in the 11th round in Monte Carlo, Monaco. Golovkin (32-0, 29 KOs) has a string of 19 knockouts. Golovkin, 32, is trained by West Covina native Abel Sanchez in Big Bear. Monroe is a light hitter. He is 19-1 with just six knockouts. He is coming off a wide unanimous decision victory over Brian Vera in January.